Review of Scrivener for Content Writing as a Therapist. Free Template. Scrivener is a software program that is easily adaptable to your needs as a therapist to generate written content. It is similar to Microsoft Word in form, however, it provides a more evolved management system for all of your content writing. When using Microsoft Word, you usually use one document for one purpose. The “pages” flow one after another which means your content should be written in a logical sequence focusing on one topic. 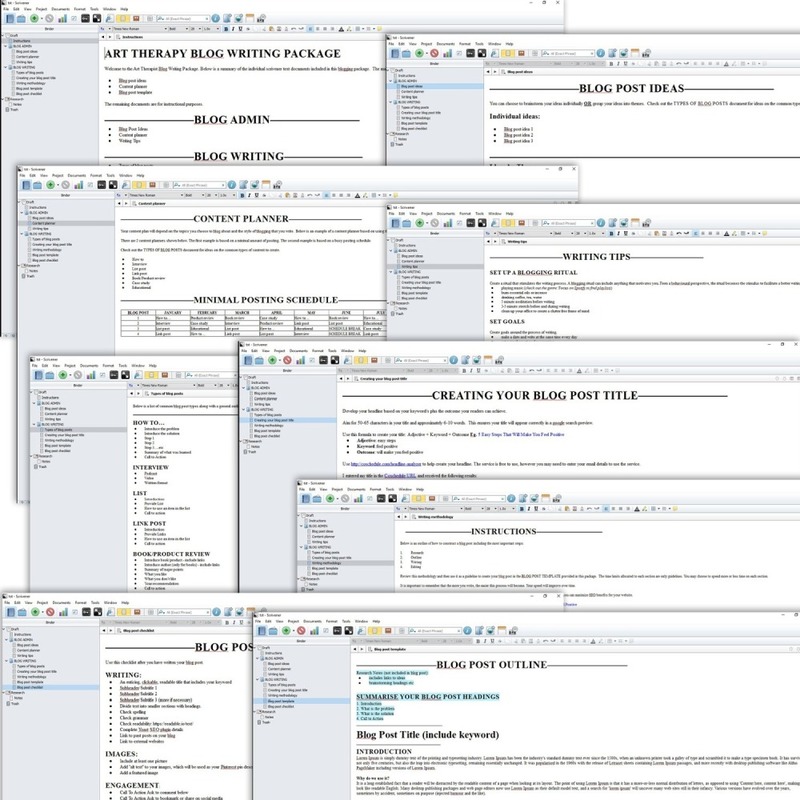 When you want to write about another topic or create a new writing project, you then have to create another Word document. Before you know it, your hard drive is filling up with many individual documents for each piece of content you create. With Scrivener, all of your writing content and individual projects can be stored in one file. 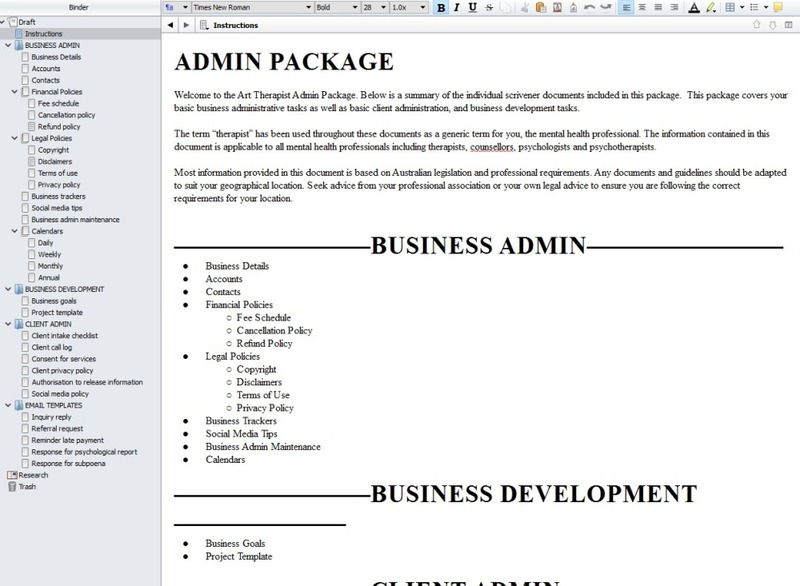 The unique feature of Scrivener is that it allows you to create individual documents. 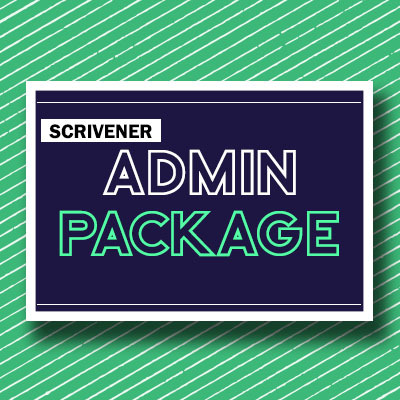 Scrivener also provides the ability to create folders and subfolders within the program so that you can manage your documents. 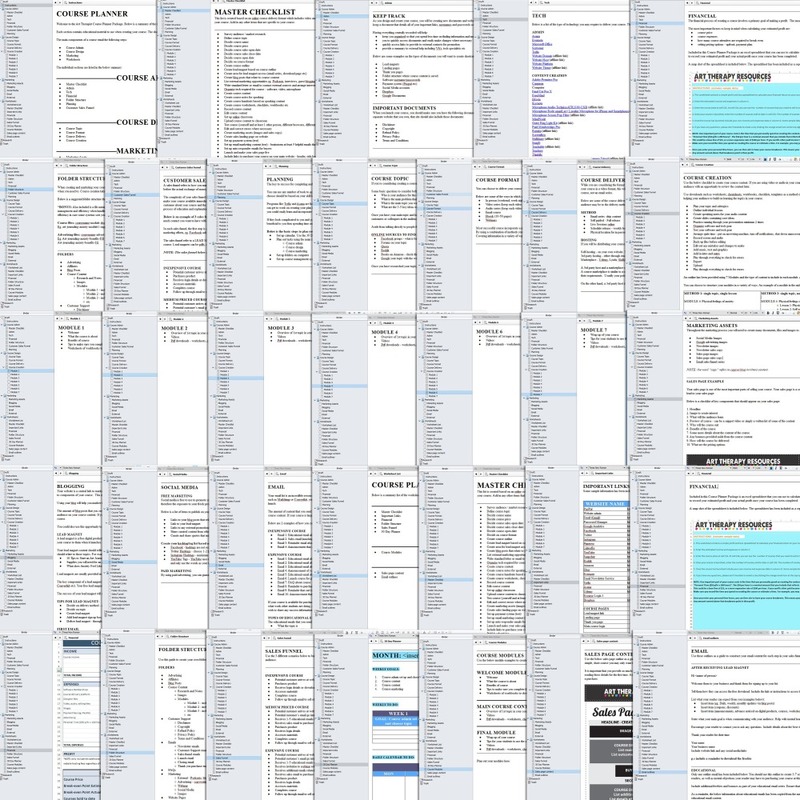 Below is a snapshot of a Scrivener project, which is one main file. You can see in the image on the left hand side, how the structure of the file is organised. Each individual icon that looks like a piece of paper is a document. Each blue square icon represents a folder where you can store multiple documents. The ability to have all of your writing documents in one file allows you to easily switch between tasks without the need to continuously open individual documents. This is useful if you need to access information from other sections easily without being interrupted by the process of searching for separate documents. Scrivener allows you to choose your own icons to represent your folders and documents so that you can easily identify your content according to your preferences. In addition to writing all of your content in Scrivener, you can also use it to hold your notes, research, and planning ideas. For each of the above projects, you can organise your sections into research, notes and final writing. Scrivener allows you to plan, organise, write, edit and compile any type of content writing project. Scrivener then enables you to publish your content into external files including ebooks, pdfs and html. Scrivener is also customisable and allows you to create a writing environment that suits your style. Within each of these folders, there are individual documents. Scrivener was originally designed as a writing tool for writers and therefore it contains powerful features that will enable you to create books. 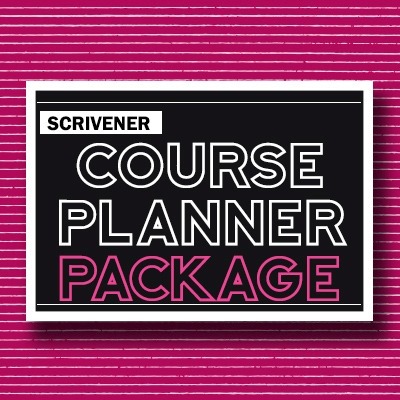 While you’re working through the free course, you can also download a trial version of Scrivener for 30 days. You can access the trial version download here. This blog post will cover some of the ways you can use Scrivener in your therapy business. You should also google for other reviews and sources about the use of Scrivener to get alternative views on how this comprehensive program can benefit you. Be sure to include YouTube as a source for learning about Scrivener so that you can see the program being used. There are a lot of free Scrivener templates available on the internet that you can download. Any template can easily be customised to suit your preferences. The organisational features of Scrivener make it a robust program for creating your blog content. In addition to writing content, Scrivener can also import images and graphics so that you can create your blog posts exactly as they would appear on your website. As part of customising your Scrivener set up, you can choose to show the folder and file outline on the left hand side of the pane. 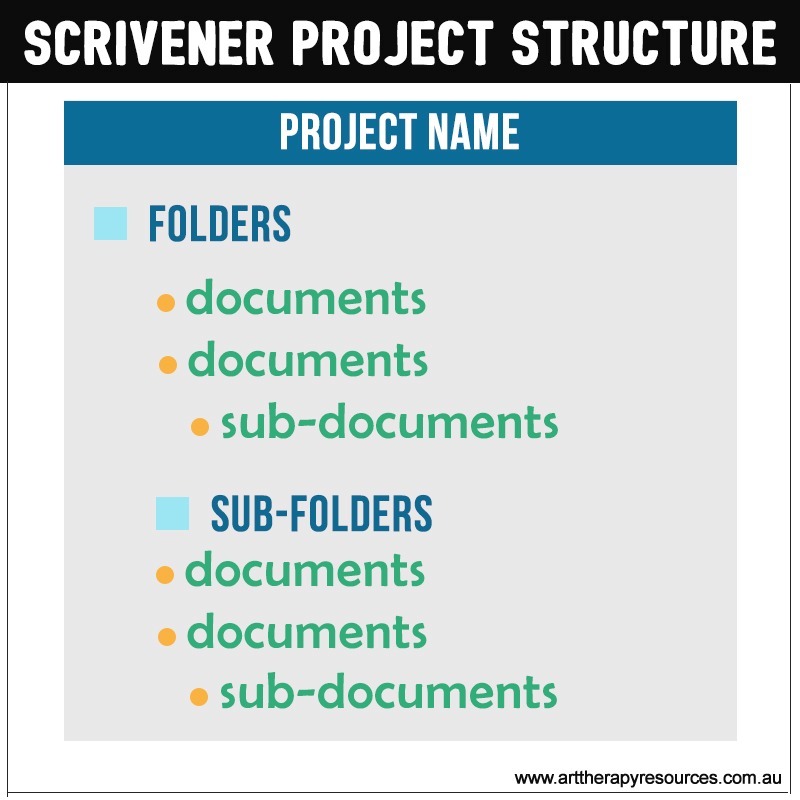 This enables you to easily move between sections of your overall Scrivener project. An important SEO tactic of blog writing is to continually link to your own articles within your website to consolidate the link between all of your content topics. Because you can easily move between files and folders within Scrivener, this provides you with the ability to easily refer to past written content through the navigation process or by using the search function. 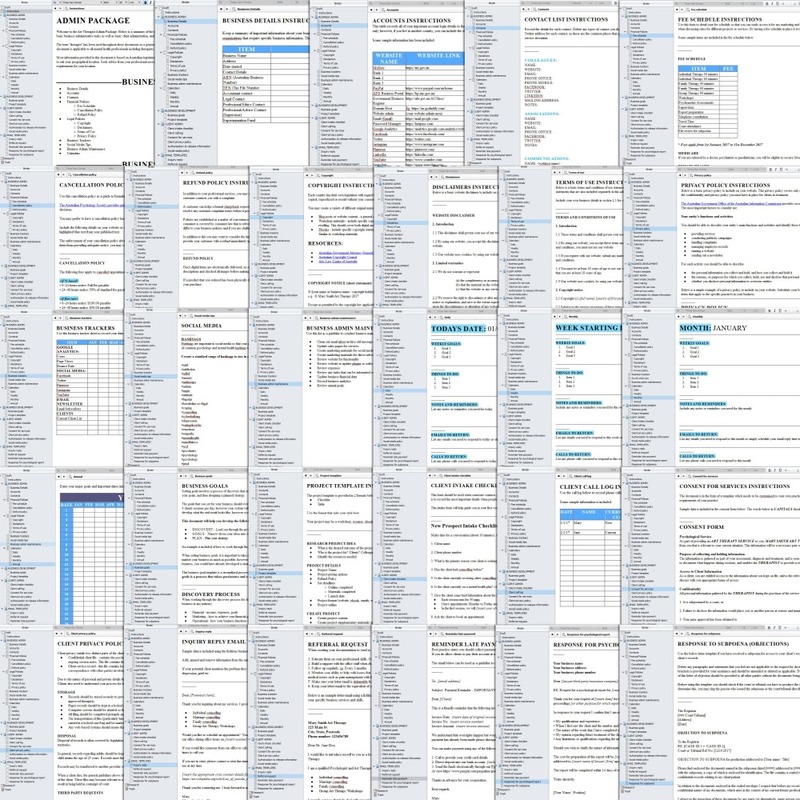 You can see at a glance how many times you’ve written about a specific topic. 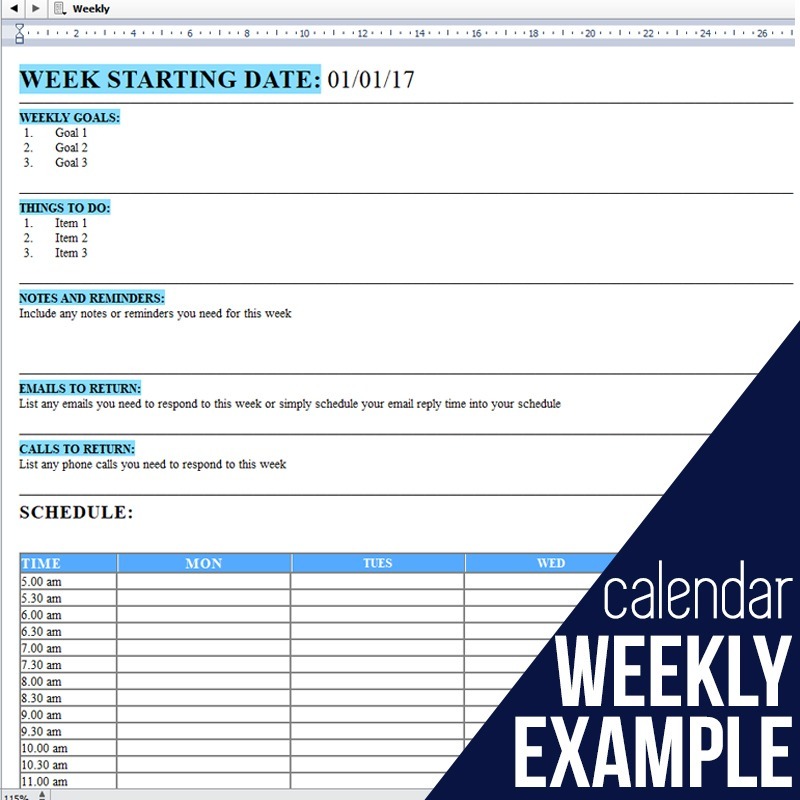 One of the integral parts of your blog writing is establishing an editorial calendar which helps you plan and manage your blog content over a period of time. 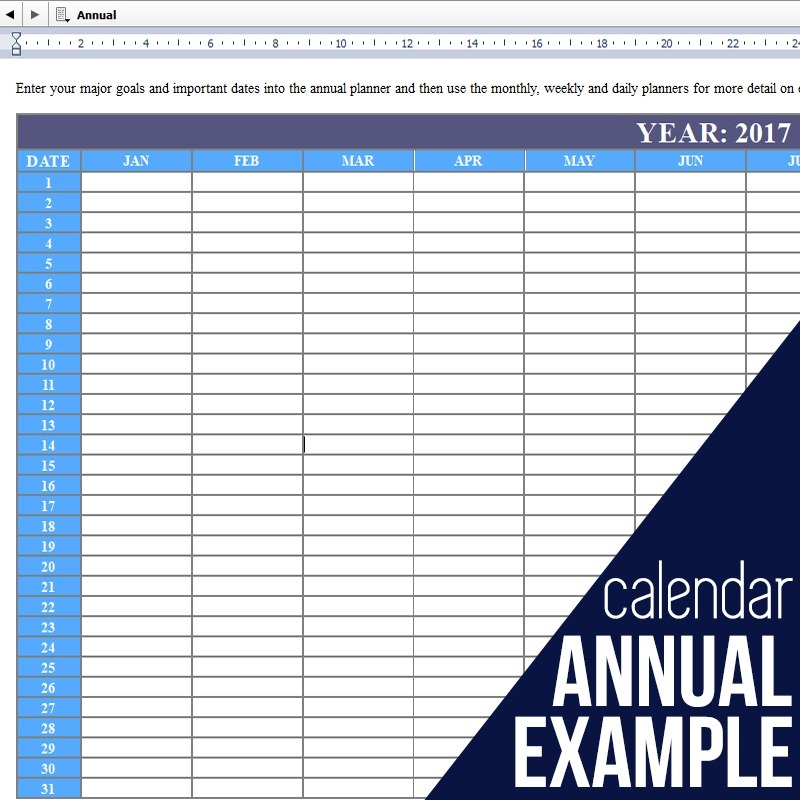 Scrivener incorporates the use of tables which enables you to create traditional calendars that give you a visual representation of planning your blog content. 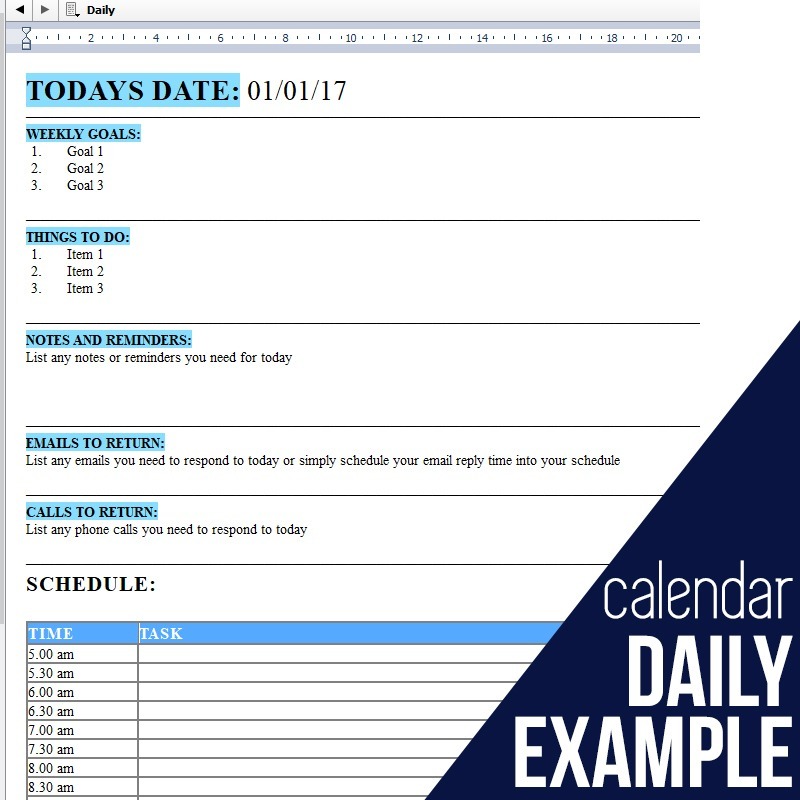 You can easily format your calendar to the colours and style of your preference. Scrivener also incorporates label features so you can easily categorise your blogging content. Scrivener also has the primary editing features of spell check, thesaurus and word count. You could also choose to organise your blog content based on a standard writing process of ideas > drafts > editing > published. Scrivener a status system that enables you to mark content as To Do, First Draft, Revised Draft, Final Draft, Done, In Progress and Outline. You can also add and edit your own status labels to make the system more meaningful to you. Scrivener also has a labelling system which you can customise to help easily categorise and identify the status of your blog posts. Scrivener is also useful for creating content used in workshops and ecourses. You should have gained an understanding of the organisational strengths of Scrivener from the section about blogging. This organisational foundation enables you to brainstorm, create and organise your course content all in one project file. 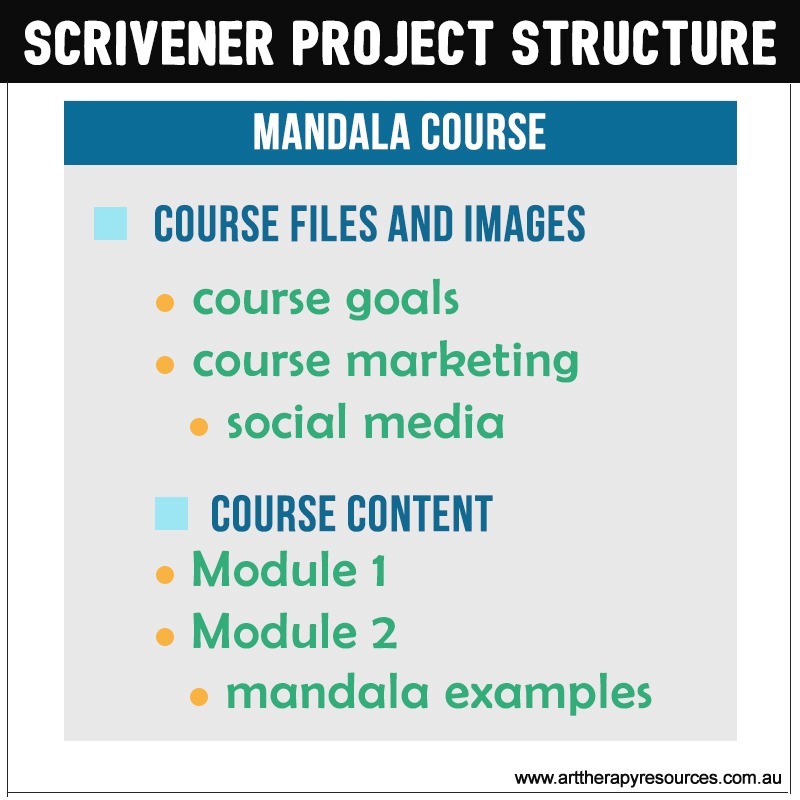 Below is an image that showcases how you can set up your Scrivener project for your next course. 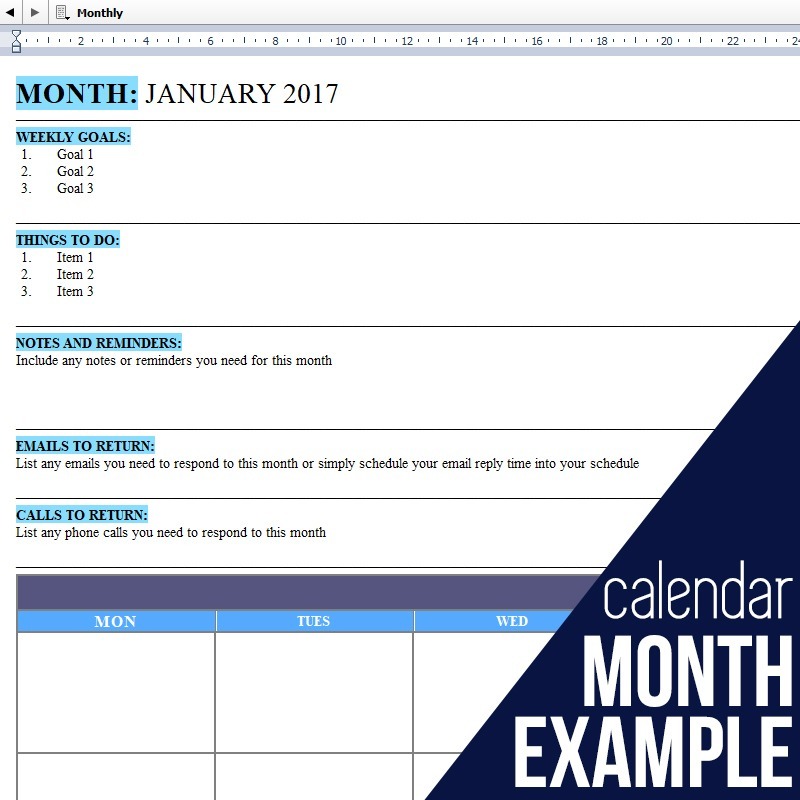 The first image shows the basic layout you can create and the second image shows that layout using a Mandala course example. If you’ve created a course or workshop before you will have experienced the amount of changes and restructuring that occurs while you develop your course content. Scrivener has the flexibility to enable you to facilitate the changes you need to make by making it easy to separate or consolidate the content of your course. Scrivener was originally intended as a writing tool for authors of books, therefore it contains a number of features which make creating an ebook easy. Scrivener comes with some predefined templates that you can use to create your ebook. If you are writing content for the art therapy field, using the Non-Fiction template will suit your requirements. Scrivener also has a Corkboard feature helps facilitate planning for your ebook content. Using the corkboard feature provides an ability to drag and drop index cards that you create based on your ebook structure. As you write your ebook, you can use the Scrivener features of adding document notes. This will enable you to make notes on areas that require further research. Once your ebook is created, Scrivener makes the editing process simplified by enabling you to easily move content within your project and its individual sections. After your ebook is complete, Scrivener then provides a compilation feature which will export your book based on standard ebook format. You can also generate a table of contents with HTML links that the reader can use to navigate through your content. Scrivener has all of the common editing features of spell check, thesaurus, headlines, bold, italics etc so that your ebook will be professionally created. 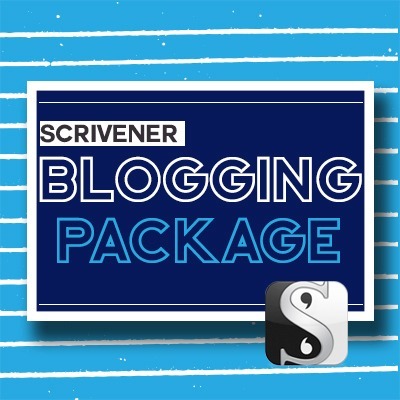 You can purchase Scrivener here. Scrivener is available in Windows ($40 USD), Mac ($40 USD) and iOs ($19.99 USD) formats. Each product is designed for you to open as a template to import into your Scrivener program. All of the organisational structure is provided for you along with prewritten prompts and content. You can view more details about the content included in each package by clicking the links above. Images are also included to show you the content provided in each package. 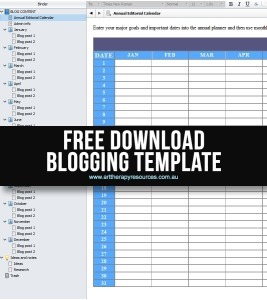 SIGN UP below to download the FREE Scrivener Annual Template for Blogging to plan and create your blogging content over the entire year. 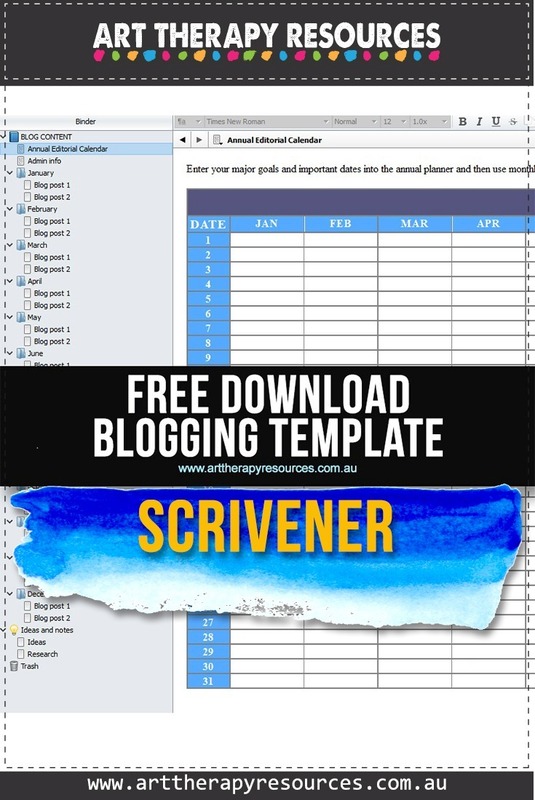 Download the Scrivener Annual Template for Blogging.